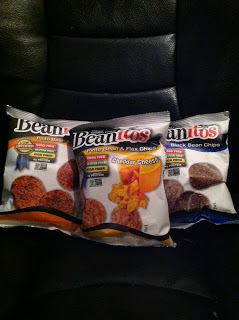 Do you remember our review of Beanitos? HERE IT IS! We would love to share a CASE of Beanitos with one luck winner! I would love the black bean chips!! We love black beans around here! i want the black bean chips! I think the black bean chips look yummy! The black bean chips look yummy! I would like to try the Cheddar Cheese Pinto Bean & Flax Chips. Would like to try the BBQ! Black Bean Chips served with plenty of homemade guacamole and a few bottles of cold Mexican beer. The pinto bean and flax cheddar sound great! cheddar cheese sounds the best. I think chipotle bbq sounds like a good flavor. I think I'd like the black bean chips. I would like the Beanitos Pinto Bean Chips. The Black Bean sound good, as well as the Cheddar Cheese Beanitos. I'd like to try the black bean chips! I love them all, I eat them all the time! I'd like to try the pinto bean & flax. I think the Cheddar Cheese chips look delicious. I would like to try the black bean ones!